Referring to Florida State’s Gameday Magazine as just a program is like referring to the Seminoles as just another team. These publications are national leaders in quality and content and these two criteria make them leaders in advertising space opportunities. 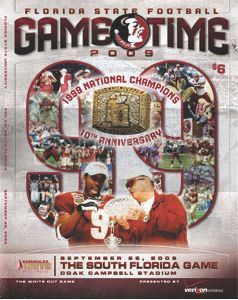 The Official Game Magazines are published in association with the FSU Athletic Department. The perfectly bound publications are full of color photography and interesting facts and figures on the Seminole teams and coaches. FSU Gameday Programs are collectibles and have a readership of 3.5 readers per copy, providing long-term exposure and shelf life. Estimated cumulative readership of almost a quarter million! Home football games average over 83,000 fans!